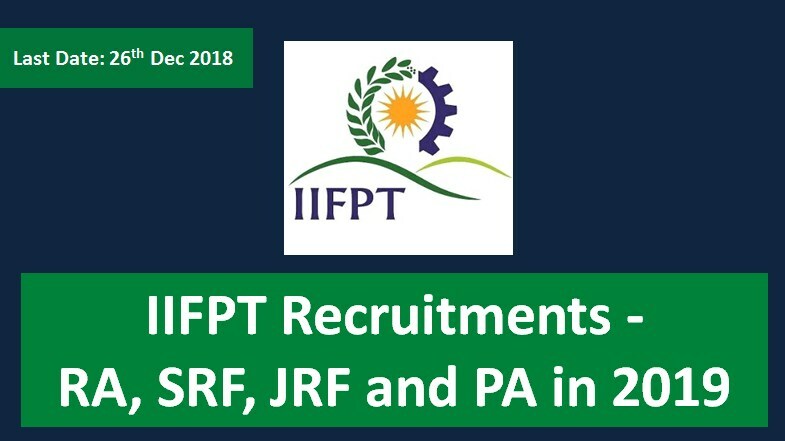 Indian Institute of Food Processing Technology (IIFPT) holds walk-in for the post of RA/SRF/JRF/PA in Thanjavur, Tamil Nadu on 26th December, 2018 at 10.00 A.M. The posts are limited and the tenure would be time bound. 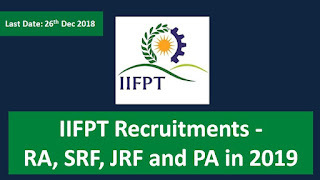 Or, M.Tech in any of the above subjects with 1st division or 60% marks or equivalent overall grade point average with at least two years of research experience as evidenced from fellowship/associate/training/ other engagements. Published research papers will be desirable. Appear in short duration written examination. Be present with original caste certificate, grade card, mark sheet, publications, 2 coloured passport size photographs, age proof, CV and two sets of the aforementioned documents’ photocopies. The selection is a sole discretion of the competent authority. The selected candidates will be informed through an email/letter. No separate interview will be held.